Who would I be without my work? 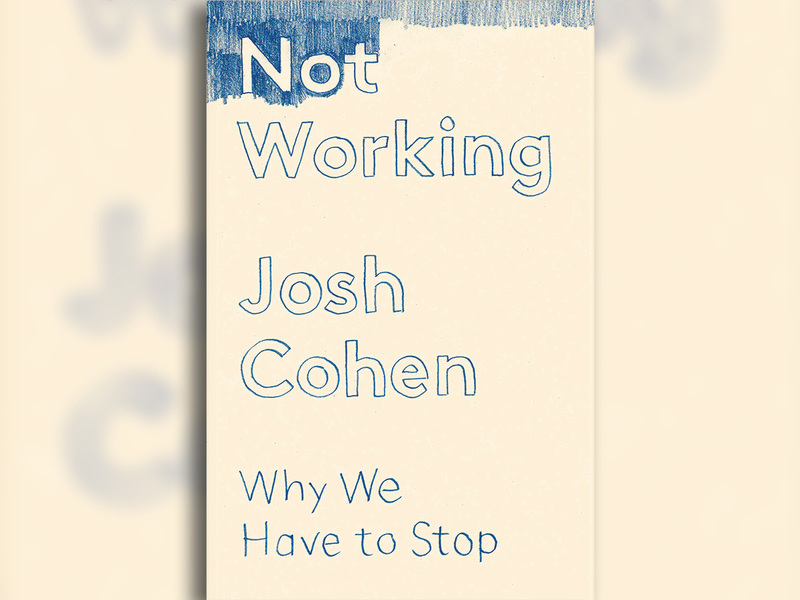 I sometimes wonder about this, and perhaps the existential dread the question stirs in me is one reason I found Josh Cohen’s book Not Working: Why We Have to Stop at times uncomfortable to read. Turning its pages, in which its author, a psychoanalyst, makes great claims for a certain kind of inertia, I had little choice but to consider why I work as hard as I do, and what might happen (nothing good, in my view) were I ever to stop. There is, I think, no ignoring the fact that, even in those of us who love and need work, lethargy is always lurking, ready to rise up and paralyse us — whether for a few moments or a few months. Cohen is good at revealing all the ways in which, even as the 21st century induces exhaustion, it banishes the expression of it; and everyone will recognise what he has to say about how life can feel like a facsimile, one in which we merely go through the motions, when we should be living it to the full. His account of Herman Melville’s story Bartleby, the Scrivener, about a clerk who refuses to do any of the tasks required of him with the words: “I would prefer not to”, makes you want to read it immediately. Nevertheless, Not Working is rather a clunky mashup of case studies, memoir, literary criticism and biography. His wildly creative slackers and opt-outers include Emily Dickinson, Andy Warhol and Orson Welles — examples so extreme as to be less than useless in terms of illuminating his central arguments about the possibilities of non-work. It’s not always easy to see how these composite parts fit together, and it’s difficult, too, not to think that Cohen doesn’t sometimes make a little too much of, say, his childhood dreaminess or his inclination, as a PhD student, to sit around doing nothing. It’s not only that we’ve all been there. But, given his academic qualifications, his several books and his dual career, his confessional tone is distinctly unconvincing. Staring out of the window seems to have done him nothing but good. But perhaps this is half of his point. Cohen shares the conviction of the British psychoanalyst Donald Winnicott that creativity depends on maintaining contact with the “still, silent spot” at the heart of the psyche; withdrawal into solitude, and the benefits this may bring, is one of the themes of his book. Perhaps, too, he seeks to make us, his readers, feel a little better about our fears when it comes to slobbery and distractedness by offering a sense of solidarity — and he’s certainly right to imagine we’re afraid. Moral disapprobation of apathy and collapse may be traced to medieval times and beyond. Though we’re a more secular society now, our feeling that those who cannot, or will not, work are putting themselves in some kind of spiritual danger is hard to shake off, even if this isn’t necessarily how we would articulate it. If the daydreamer resists gravity as he rises above the clouds, the slob gives in to its downward pull. Of course, there is another way: my own understanding of these things is Larkinesque. I wouldn’t toss the toad work off my back even if I could, for what would freedom mean without it? Would it exist at all? But this isn’t to say that, for all its frustrations, I didn’t warm to Josh Cohen’s book. It is very nice — comforting, even — to be told that it’s OK to stop, even if such a strategy is, for you, impossible. I’ll keep the idea in reserve: a light thought alongside all my dark ones.